To be frank, Saudi Arabia is setting a steady course, Russia is falling behind, and China will benefit no matter what. Ever since Saudi Arabia began coordinating OPEC oil production cuts with Russia in November, 2016, observers have scrutinized the two oil giants’ relationship for signs of a strategic rationale. King Salman’s first visit to Moscow early last October was perceived by many as proof of serious change. Writing for the National Interest, Samuel Ramani went as far as to call the visit “a sweeping transformation of Russia’s diplomatic conduct in the Middle East and strategic objectives in a critically important region of the world.” The rhetoric of strategic partnership has only ratcheted up with news that Saudi Aramco was mulling work with the Russia Direct Investment Fund (RDIF) to help a group of Russian and Chinese investors buy Aramco’s upcoming IPO. Energy is usually cited as a cornerstone of strategic partnership. But Ramani, as well as more strategically skeptical takes, rarely ask in any detail what Russian and Saudi energy interests actually are. When it comes to petropolitics, amateurs talk strategy and professionals talk logistics. 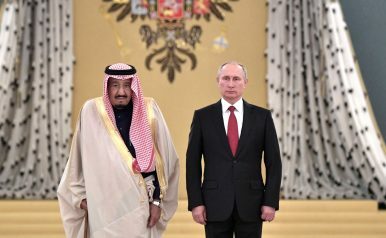 China, the Asia-Pacific, and rising U.S. oil production are driving oil cooperation between Russia and Saudi Arabia as the countries’ respective corporations continue to compete. Last year, China overtook the United States as the world’s leading oil importer. China’s oil imports sharply rose to a record 9.57 million barrels per day (bpd) in January, a 20.5 percent increase year-on-year. China is increasingly oil hungry. Though demand growth is expected to slow from last year’s 5.5 percent to 4.2 percent this year, domestic production is falling. Last September, an article published in Petroleum Science argued that Chinese oil production would peak this year. Import dependency will only rise, particularly as shale production is not feasible without huge amounts of water. Rosneft, Russia’s state-owned oil giant, closed deals with China’s CNPC to increase daily oil deliveries by 300,000 bpd to a total of 600,000 bpd over the next 25 years in 2013 before the price collapse. Rosneft – then facing $38.7 billion in debt maturities between 2013 and 2015 – was to receive as much as $70 billion in prepayments from CNPC and Chinese banks. The deal bankrolled a series of pipeline projects and capacity expansions that have since netted Russia the prize they were after – to displace Saudi Arabia as China’s leading oil supplier. After selling 14.16 percent of its shares to China’s CEFC Energy in September – a side effect of the complications of its 2016 privatization deal imposed by financial sanctions – Rosneft signed further supply deals with CEFC China Energy in November that will increase daily deliveries by roughly 240,000 bpd over the next 5 years. In 2017, Russia sold China an average of 1.2 million bpd against Saudi Arabia’s 1.048 million bpd. Rosneft has prioritized capturing market share and attracting Chinese investment given its lack of options elsewhere. Overall, Rosneft and its CEO Igor Sechin have done all they can to capture the China portfolio for energy diplomacy, though other firms can sell oil on spot markets via the Eastern Siberia-Pacific Ocean (ESPO) pipeline to China’s privately-owned refineries. Russia’s ability to finance expansions of production and export capacity in Eastern Siberia and the Far East have given it a leg up on Saudi Arabia’s oil giant Saudi Aramco and established Rosneft as the country’s oil major in the Asia-Pacific. Rosneft made a splash by acquiring 98 percent of the Vadinar port and refinery in Gujarat, India from Essar Oil for $12.9 billion along with trading house Trafigura and UCP, a Russian investment fund. The refinery has a capacity of 400,000 bpd, a keystone acquisition in what is becoming the world’s fastest-growing oil market. Unfortunately for Russia, the deal drew scrutiny from the Home Ministry and Intelligence Bureau in New Delhi because of the inclusion of the port. It’s also true that India Inc. felt jilted as Essar Oil could have turned to domestic firms. Sanctions cast a shadow too. Essar is in search of another $1 billion to close out the deal, but has faced difficulties raising funds at international banks. Essar had lines of credit with 26 banks in India. Exposure to sanctions risks are a complicating factor given warming U.S.-India ties as well. New Delhi is looking to increase the country’s refining capacity 77 percent by 2030 given growing domestic demand. Investment partners exposed to U.S. sanctions will have a harder time raising funds. The threat of sanctions risks will hinder Rosneft as it lines up its expansions plans. Doubling capacity at Vadinar is a plank of India’s national program. Rosneft’s plans to build refining projects in Tianjin in China with CNPC and a refinery in Tuban with Indonesia’s Pertamina have progressed at a snail’s pace. The Tianjin project was announced in 2009 and hasn’t appreciably budged since. Rosneft issued over $17 billion in debt last year alone to help finance its increasingly geopolitical acquisitions. The joint venture (JV) to build the Tuban plant has been formed, but there’s no public sign that financing is ready and Tuban is slated to cost $15 billion. Barrel counts aren’t everything, nor are Rosneft’s acquisitions necessarily a strong basis for further expansion. Aramco has recognized that shale production in the United States and newer capacity in Russia’s Far East have changed the landscape for its role in China and the Asia-Pacific. All of Aramco’s supplies transit the Malacca Strait – a security concern outside of China’s complete control. Russian and American deliveries don’t. Aramco is responding by building out its downstream refining operations to make money elsewhere in the value chain and secure market share. The company currently controls 5.4 million bpd of refining capacity, building into its IPO strategy plans to own or have built 10 million bpd of capacity by 2030. Saudi Aramco has planned to spend $414 billion between now and 2027: $134 billion on new wells at existing fields, $78 billion on maintaining production capacity, more than $120 billion into offshore development, and much of the remainder on refineries and petrochemical plants. Now that Aramco has opened an office in India, it’s in talks to help finance and build a 6-million-barrel strategic oil reserve as well as a refinery on India’s west coast that would have a capacity of 1.2 million bpd. Purchases of stakes in existing refineries are also on the table. The international ambitions of the country’s oil firms are likely best served by partnering with Aramco given its size, access to financing, and the breadth of its services on the market. In Malaysia, Aramco is close to finalizing an $8 billion loan with state firm Petronas to build a 300,000 bpd refinery and petrochemical complex in Johor. Aramco owns a $7 billion stake in the project. By building capacity in Johor and feeding the refinery with Saudi crude, Aramco would have more influence on daily prices in Southeast Asia given Johor’s physical proximity to the oil trade hub in Singapore. This move is bolstered by Aramco’s decision to expand into trading non-Saudi oil through its trading operations in September to supply the joint ventures it’s pursuing across the Asia-Pacific. Riyadh and Beijing reached a preliminary agreement last summer to create a $20 billion investment fund that would help finance refineries and petrochemical joint ventures. Aramco’s China engagement also extends to petrochemical projects in Yunnan and Fujian where the company is courting regional authorities. Aramco has nabbed PetroChina as its main negotiating partner rather than CNPC, Rosneft’s go-to counterpart. (PetroChina, however, is technically a subsidiary of CNPC.) Every refinery deal will build in opportunities to increase Aramco’s market share as well. Aramco also has a downstream presence on the South Korean and Japanese markets. Counting barrels today does not capture the relative balance of producer power between Russia and Saudi Arabia in China or the Asia-Pacific at large. Budgets lie at the heart of Russian-Saudi energy cooperation. Russia joined OPEC production cuts virtually the same day the Duma passed the 2017-2019 budget. Russia’s budgeteers, an increasingly powerful lobby, needed a more stable outlook for oil markets. Despite budget pressures, Riyadh has ultimately decided to spend its way out of its economic troubles. This year sees a record $261 billion budget in action, including $19 billion in stimulus spending for the private sector. Sustaining higher prices remains in both their national interests. Attempts to talk up prolonging cuts past this year are largely predicated on preventing another large market fluctuation for the sake of budgetary stability. Shale is changing the game. Last January, the United States exported virtually no oil to China. This January, it exported roughly 400,000 bpd. Prices hung around $54.48 per barrel last January. They broke $60 on average by November. U.S. shale crude deliveries are shifting some pricing power to the United States as U.S. oil futures become more and more attractive. Rystad Energy thinks that U.S. crude production could outpace both Saudi Arabia and Russia by the end of 2018. Aramco has a major advantage over Russia with the OPEC cuts in place: it isn’t under sanctions and is looking to invest into shale plays in the United States. Once a deal is reached, Aramco would be able to import the techniques and gear necessary to produce shale domestically – an area where Russia is struggling because of sectoral sanctions. Similarly, Aramco has an easier time approaching partners in Asia because it lacks the reputational and logistical risks of Russian firms. Its recent deals for Russian LNG supplies from Novatek serve their interests and signal Washington. Further, investing with Novatek undercuts Rosneft at home. Its Asia-Pacific rival recently lost a bid to export LNG from gas fields in Pechora. Holding prices higher helps Aramco’s IPO plans. Deals with Russian firms are notable, but Russia can provide relatively little financing and China owns stakes in both Novatek’s Yamal project and petrochemical firm Sibur. Companies like Rosneft, Lukoil, and Gazprom Neft all wish to see OPEC cuts end and have been sidelined with these deals. Although Russian banks and investors have expressed interest in the IPO, it’s hard to imagine that Aramco would ignore sanctions and reputational risks without a considerable political payoff. Similarly, China does not need to partner with Russia to pull off a major deal. By positioning itself through the RDIF, Beijing rather signals its dominant position in Eurasia. The announcement follows word that China will soon trade oil futures on the Shanghai Exchange. Its role in Russian and Saudi strategies responding to lower prices speaks to its ever-growing gravitational pull as an importer. Until details emerge, there’s little reason to take the RDIF angle too seriously. Moscow and Beijing love to use symbols to panic Washington. As long as both Russia and Saudi Arabia need budget revenues domestically, they will cooperate. But shale isn’t going anywhere. Riyadh bought itself time to more quickly expand its downstream operations in the Asia-Pacific and transfer technology from U.S. shale producers for domestic oil and gas production. While Russia’s firms compete with each other domestically for influence, Aramco can set a steadier course. Refining capacity and the ability to invest into the United States matter most for the next stage of their “oil alliance.” On that front, Russia is falling behind and China will benefit no matter what. Nicholas Trickett holds an M.A. in Eurasian studies through the European University at St. Petersburg with a focus on energy security and Russian foreign policy. He is a columnist and contributor for the Bear Market Brief, a blog and daily news brief on Russia’s politics and economy, and contributes to other outlets like Global Risk Insights, Oilprice, and Newsbase. Will OPEC Ease Production Cut Agreement Early?